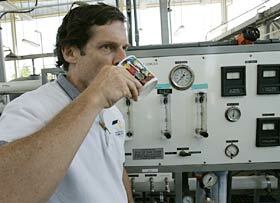 The mug of liquid in Bill Pearce's hand is served fresh from San Diego's wastewater treatment plant off Miramar Road. Pearce, a city water engineer, doesn't hesitate to take a swig of sewage that's been treated and re-treated to the point where he says government-regulated contaminants are undetectable. Pearce's pilot project could be a taste of things to come if San Diego becomes the first city in California to store purified wastewater in a local reservoir for use as drinking water. Nationwide, only one region – northern Virginia – has a comparable system. San Diego's decision promises to be driven more by the perception of the city's 1.2 million water users than what national, state and local water experts say is the clear reality: that super-scrubbed wastewater is just as good or better than water taken from the Colorado River. If San Diego officials overcome the "toilet to tap" stigma that derailed their original "water repurification" strategy in the late 1990s, they could become national leaders for a technology that some say will be necessary for water development in the arid West. Yesterday, an advisory panel of about 30 residents began discussing San Diego's six major scenarios for using wastewater to help meet water-supply needs for a rapidly growing region. The group will continue meeting today and Thursday as part of the city's $900,000 analysis of strategies for recycling water. By year's end, the panel's conclusions will be presented to the City Council, which halted its first repurification project in 1999 after public outcry. At the time, opponents dubbed the effort "toilet to tap." The phrase made national headlines and helped seal the project's doom. Objections included health, safety and operational concerns, along with the perception that lower-income neighborhoods in the southern part of the city would become guinea pigs for untested technology. Backers hope the time is right for a novel project. "This is really a very safe and conservative approach," said James Peugh, coastal conservation chairman for the for San Diego Audubon Society. In the last few years, there's been near-constant publicity about drought and possible water shortages in the Colorado River Basin. Also, San Diego has gained battle-tested experience with large-scale wastewater recycling. And environmentalists continue to push the city to do more. On the equipment side, the latest water filtration systems are more reliable than previous models, said George Tchobanoglous, professor emeritus of civil and environmental engineering for the University of California Davis. He is chairman of San Diego's independent scientific advisory panel for water reuse. Still, city officials are taking a cautious and low-key approach. They are trying to avoid another political firestorm. Their study, launched in May 2004, was praised as balanced by the National Water Research Institute in Fountain Valley. Four of the report's six main options for treating wastewater involve what technicians call "indirect potable reuse," also known as "reservoir augmentation." The process includes pumping highly treated wastewater into reservoirs, where it would mix with "raw" water from the Colorado River or Northern California before being treated again for home delivery. As a whole, the study shows no solution that meets all of San Diego's competing priorities. For instance, if minimizing costs is the highest goal, the city likely would emphasize the completion of a South Bay project to use partly treated wastewater for irrigation and industrial processes. That project would cost about $1 million. However, if city leaders aim to maximize overall water reuse, the study shows that storing "purified" water in the San Vicente Reservoir would bring the highest returns. That option is expected to cost more than $200 million. Many forum participants said the city needs to focus on educating the public about the safety of recycling wastewater for household use. "We are going to have water that is as clean as any water you can get," said Lois Fong-Sakai, a civil engineer representing the Asian Business Association. Proponents say recycling wastewater is an unavoidable necessity. They point to San Diego's projection that it will need 25 percent more water in 2030 than it uses today. The city remains roughly 90 percent dependent on outside water sources, something that business leaders and environmentalists agree is untenable. It has two plants that treat and recycle wastewater, both of them running far below their capacity. Each day, the city releases an estimated 175 million gallons of partly treated wastewater into the ocean. Opponents are still not convinced about the merits of turning wastewater into tap water. "You think Dracula died, but in the movies Dracula always comes back for a repeat appearance, and that is where we are right now," said Howard Wayne, a former Democratic state assemblyman from San Diego and one of the people who made the "toilet to tap" moniker stick. Wayne and other opponents worry about scientists not being able to detect all possible contaminants and the possibility of malfunctions at the treatment plants. Detractors favor looking at additional water purchases and using recycled water only for irrigation and industry. Many residents remain uneasy about drinking treated wastewater. Only 28 percent of them supported the concept in a phone survey of 710 adults conducted last year for the San Diego County Water Authority. Going into yesterday's meeting, many participants and interest groups said they were taking an open-minded approach. For instance, the San Diego Regional Chamber of Commerce supports water reuse but is waiting to see what the city panel recommends before it considers specific ideas. "We want to do it in a way that the community is going to accept," said Craig Benedetto, chairman of the chamber's infrastructure committee. Environmentalists generally support reuse projects, including reservoir augmentation. "We cannot continue to use . . . the Pacific Ocean as our dumping ground" for sewage, said Marco Gonzalez, a lawyer for several environmental groups. "We are wasting water and we are harming the environment and we don't need to." Water agencies in San Diego County are exploring ways to increase the supply aside from treating wastewater for residential consumption. They want to further conserve water, desalinate seawater and importer water. Recycling wastewater for use on highway medians and golf courses also plays a role. Such efforts have yielded limited success in the city of San Diego because they rely on an expensive system of pipes to carry nonpotable recycled water. Those pipes are painted purple to distinguish them from pipes that transport drinking water. In contrast, reservoir augmentation would require expansion of a treatment plant and laying a pipeline to the reservoir. Because the rest of the delivery system is in place, it is viewed as a much less cumbersome approach than laying purple pipes all over the city. A few large agencies in Los Angeles and Orange counties use treated wastewater to recharge drinking-water aquifers – not above-ground reservoirs – and protect them from seawater intrusion. San Diego doesn't have a substantial aquifer like Orange County, a national leader in water recycling, so it has been forced to look at other options. The water-purification process is basically the same regardless of where water is stored, scientists say. G. Wade Miller, executive director of the WateReuse Association in Alexandria, Va., said San Diego's proposal faces a formidable hurdle: "The simple answer is public perception . . . that this water . . . is from a highly contaminated source." The association, which supports a variety of reuse methods, went so far as to consult psychologists last year in an attempt to understand public fears. One key finding was that people are much more accepting of "natural" water sources such as the Colorado River, even if those sources include wastewater. Most of the nation's major rivers, including the Colorado, serve as both dumping grounds for treated effluent and water sources for cities downstream. The Southern Nevada Water Authority, which provides water to the Las Vegas region, has for decades been pumping treated wastewater back into its massive reservoir, Lake Mead. "It's happening all over . . . the world," said water authority spokesman Vince Alberta. "It's just that it's happening way upstream from where you are (in San Diego), so you are not thinking about it."